Here are some of the items offered that commemorate our most recent activities. Peruse at your pleasure; call or e-mail to acquire! Our Coloring Book is available to any child who applies to become a member. Our coloring book is an exciting collection of line drawings based on Polish Union of America activities and traditions! 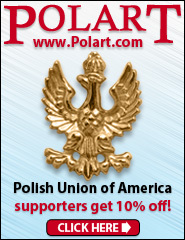 Part of the profits from the order you place with Polart will benefit the Polish Union of America.